My City vs Your City is a fascinating information widget designed by Michael Schieben. 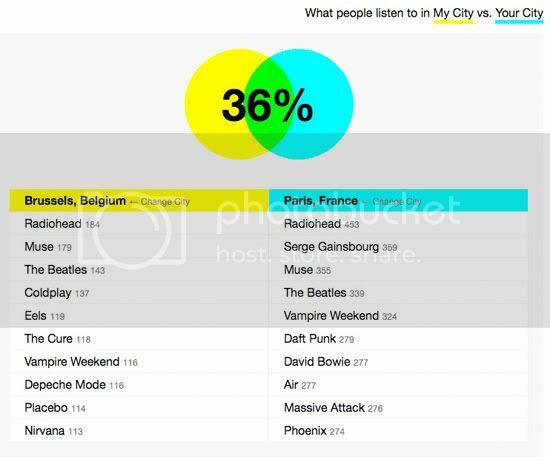 It takes data from LastFM and organises it so that you can compare the Top 10 most-listened-to artists in any two cities of your choice (as long as they're on LastFM's list of cities, and have active listeners). The clean and attractive interface then gives you a percentage overlap between the two cities. It's almost as if someone or something has got to them. The same "someone" who commands people all over the world to wear blue jeans seems to be laying down the law, or subtly inveigling its norms into people's desires. THOU SHALT HAVE A MAXIMUM OF THREE DOMESTIC ARTISTS IN THY LASTFM TOP 10, this "something" says, UNLESS THOU ART FRENCH OR JAPANESE. Yes, according to this widget it is only cities in France and Japan in which we find people willing to go beyond this unofficial "30% local cap", this unwritten "commandment of monoculture". Paris boasts 40% domestic artists in its list (Gainsbourg, Air, Phoenix, Daft Punk), while Tokyo charts a massive 70% of homegrown talent. That's almost complete self-sufficiency! No need to import any foreign music except the odd Beatles and Radiohead mp3! Nowhere else can match this extraordinary Japanese achievement (which could be a fantastic blow struck for autonomy, or a kind of navel-gazing autism, depending on your perspective). Even in China -- confident, fast-growing China, which just took Japan's place as the world's second richest nation, and is on track to be its richest within ten years -- LastFM users are only tending to let one single measly Chinese track into their Top 10s. There are, of course, two nations who listen almost exclusively to music made within their own borders: the US and the UK. No, make that three, because Japan does too. Where the US and the UK differ from Japan, though, is that they export their local culture all over the world. Nobody outside Japan is listening to Japanese music. Japanese music isn't a hegemony, and Japan is not a music hub. I must say, I find the picture that emerges from My City vs. Your City a deeply depressing -- and sadly familiar -- one. What this widget makes visible is the same one-way cultural flow I described in (Don't want to live in a) hub and spoke world and Culture flows through English channels, but not for long. In the terms used by airlines for their route maps, culture is flowing in a clear hub-and-spoke pattern, radiating out from a strong central point, rather than in a point-to-point way. Comparing Porto in Portugal with Porto Alegre in Brazil, I'd have hoped to see a little point-to-point cultural action going on based on the fact that these two nations share a language, Portugese. But no, neither Porto nor Porto Alegre is using LastFM to listen to anything in Portugese. If they have anything in common, it's their love of Metallica and the Arctic Monkeys. You can only "fly" from Portugal to Brazil via LA or London. Another way to look at what's going on is to say that we live in a world in which global pluralism is "asymmetrical" rather than "symmetrical". Many are not speaking to many on a level playing-field; someone is at the centre, speaking, and all the others are ranged around that "someone", listening, and mostly inaudible, even to their immediate neighbours. 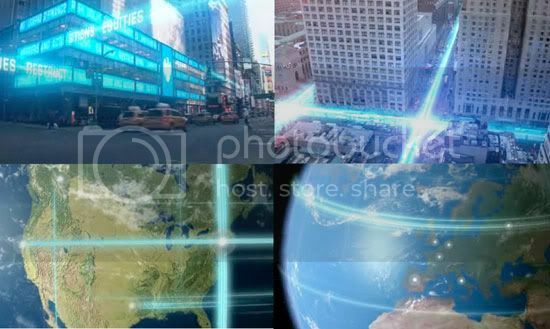 In the words of the Barclays Capital slogan, this is "global reach, built around you". As long as you're an Anglo-Saxon. According to last.fm, Mexico would not have any local artists in its Top 10 list, but that is because the music taste of the sort of people who would have a last.fm is very different from the music taste of the general population. If My City vs. Your City could scrobble an accurate picture of what Mexicans listen to, you would see a lot more local artists. I imagine something similar might happen in China. That being said, I'm surprised that not even Café Tacvba makes the Top 10 list, being the only Mexican band that measures up to the highest international standards in terms of creativity and production, and also being one of the most popular acts in the country. But, there's some problems with this - eh? Even though we're going with percentages here, could there be only 10 people in Turkey *with* the last.fm widget scobbling? Is last.fm available in any other language, except English? I did only a quick cursory glance and couldn't find a way to change the language, although I did find the widget to change the URL to another CBS-owned site. I also know that when in Paris, it didn't change to a French interface, even though other sites (Google) do. If this is true, it's possible that what we're seeing is what's scrobbled by anglophones, generally. Japan may be the exception, but most everyone learns English in Japan at an early age, anyways, no? Enough to use an English-interface without much problem. I stand corrected on that one - there is a language pref - next to the design pref. The list of Chinese options is big coastal cities and Beijing (and its satellite, Tianjin). The only exception is Changsha, the birthplace of Mao Zedong, in Hunan province, where the only Chinese entry is for a Taiwanese artist. But... as you noted, this is LastFM, not QQMusic or Baidu MP3's list. Stuff like Lady Gaga does okay in Shanghai (or Taibei), but doesn't really break into the other half of China, the vast inland region, which is still very nativist in its media consumption. I think Koreans and Taiwanese are making a lot more money and have a higher profile in Changsha (or Lanzhou, or Nanjing, or Ha'erbin) than Lady Gaga has. I think LastFM is giving a good picture of what urban elite kids are listening to in these towns, though: Wang Fei and Green Day. A lot of Western critics think of Chinese censorship as a means of protecting the position of the Chinese Communist Party, but I think a lot of it also has to do with protecting indigenous culture, whether it's pop music or Twitter-clones or homegrown neoliberalism. Superficially, China does look pretty confident, right? But that confidence quickly crumbles in the face of any imagined meddling by outside forces (whether the United States or Uighur activists or Han Chinese who are too fond of elections). China, a lot of the time, swaggers and puts on fabulous shows for the world, but it is still deeply culturally anxious, in a way that Japan isn't. Chinese cultural critics often combine a sense of superiority with an amazing capacity for self-doubt. I think that's one of the reasons why China will continue to resist, or minimize, the influence of world monoculture. I think the vision of liberalizing China that Western thinkers love to describe often clashes with the vision of liberalizing China that Chinese thinkers are working with. In the Western vision, China is opening up to Western ideas and influence; people are watching Prison Break and buying Nikes, embracing neoliberalism. But in the Chinese imagination, the opening up definitely does allow Western culture/ideas to enter China but the most important part is the opening of the exit gate for Chinese cultural products and ideas. Western thinkers look at Chinese culture and, viewing it through the prism of Western thought and culture, see, of course, Western thought and culture and the glorious or inglorious spread of monoculture. Chinese thinkers (except far left nationalists who are quite fond of seeing the negative parallels between the new Chinese elite and the Western elite) are a lot less likely to identify the Western DNA in ideas like neoliberalism or televised singing contests. Should't you be out spotting trains? No Iceland on the list, unfortunately. I would expect them to be above 30% threshold as well. Yes, but I think it's a very, very interesting situation to see how the Japanese have completely bucked the global pattern here, and continue to have a healthy indigenous music scene. I hear that Japan is now the biggest CD market in the world, too; sales have not been affected by file sharing the way they have in other territories. To answer the fascinating question of why Japan is such an outlier in terms of music consumption, I think we have to set aside the subjective question of "quality" and look instead at specific business practises and specific cultural mechanisms. France and Japan both feel their "cultural exception" strongly, but France has by and large tried to combat the virulent Anglopop stranglehold via legislation (quotas and so on), whereas Japan has used purely commercial means. This means that the "quotas" are hidden within semi-secret commercial maxims, deals and understandings. We could call this "commercial passive aggression", and the Japanese have been remarkably successful with it. But ultimately the desire to listen to pop music from your own culture has to exist within the consumer. It's not just a matter of the convenience of lyrics in your own language -- that's not enough. There must be a sense that you're wired differently, emotionally and culturally, from other people and need a music which reflects that. There might also be a sense that the music of other nations reflects something undesireable, something those nations have in their DNA. I think one of the most remarkable things is that Japan continues to be seen as a good ally to the West while saying, in its domestic culture markets, such a firm "no" to Western cultural products, and being the only nation in the world with both the economic means and the cultural will to form this "no" (which is still only a partial "no", a "limited yes"). Wow, Shizuoka 90% domestic! Massive! The new Sakoku! I don't really accept that what last.fm listeners listen to has much to tell us apart from what it is that last.fm listeners listen to. Outside the US/UK and the major European cities, last.fm listeners are going to be a minuscule portion of the population that is already heaviily geared towards Anglo pop culture. For instance, when I was in Brazil, all I heard was Brazilian music and all people seemed to be interested in was Brazilian music, bar the odd Madonna CD or whatever. Walk into a random bar in Rio, and you are almost certainly going to hear Brazilian music. And yet last.fm supposedly tells a different story. Take a quick glance at the Brazilian top 20 and you'll see that the clear majority of songs are Brazilian. Aha, this is the first zero percent overlap I've seen: Tokyo and Stuttgart! Another interesting application: Michael promises to program a "Me vs Your City" feature into the next release which will allow you to line up your own personal Top 10 against those of various cities, and calculate which city most closely matches your taste. Music has proved to be very useful as a "taste filter" and "sensibility guage" in things like dating sites; now it could help you decide where in the world to live. -because of what a few last fm listeners listen to? Music is a big thing for me, but I've never used last fm much, it's never seemed necessary or perhaps I've never had the time. When I moved to Berlin some years ago, if there would have been any musical reason to it, it would have been with people like Patric Catani and early Cobra Killer in mind, but I doubt last fm would have reflected that. You would just as likely find them on, say, Australian lists, due to their having toured there previously when few small European bands make it that far. If I wanted to meet other people who listen to the Boredoms I'd just as soon go to New York as Tokyo. I'm not going there to look, but would last fm tell me where to find other Joemus listeners? Isn't there a danger of measuring cities by a yardstick the US and UK kind of invented (exported pop music)? Somewhere in China there is a website comparing beansprout consumption by country. Local zealots are confirmed by the results "Right on. Go us! "; local liberals sound a more cautious note "I feel so ashamed. To dominate so flagrantly." I don't for a moment accept that the US and the UK invented popular music. Every culture has its own popular music. Some have just had their markets swamped by (and have voluntarily embraced) Anglo-Saxon pop. One thing we haven't mentioned is that since English is basically the world's default lingua franca, many people use pop records as a language-learning tool. Another thing we haven't considered is that the "domestic" pop consumed in Japan and elsewhere is often painstakingly exact replicas of Anglo-pop with Japanese artists and lyrics (typically Japanese lyrics on the verse, English ones on the chorus) overlaid. Why the predominance of Radiohead though (here and on those endless Q/Mojo best music ever lists)? I understand people all wanting to listen to the Beatles (and Lady Gaga to some extent), but Radiohead?